If you’ve been following me here on Baby Chick for any length of time then it should come to no surprise to you that hosting parties is my absolute favorite! 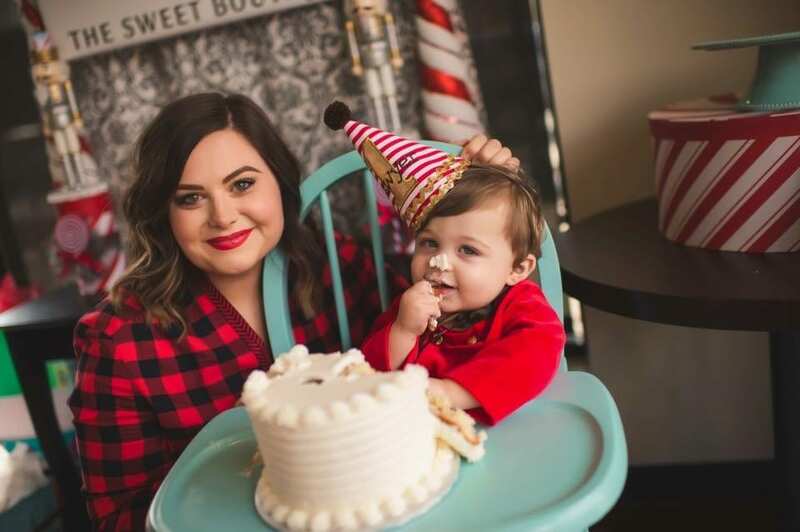 When our sweet Sawyer turned one (one year ago today – today is his 2nd birthday! ), we decided a birthday soirée as sugary as he is was in order and we wanted to honor our littlest boy in the biggest way! So we rented out our favorite bakery, The Sweet Boutique in Katy, Texas and set up Sawyer’s Sugar Plum Shoppe! The nutcracker holds a special place in my heart, so we ran with the theme for a dessert and cookie decorating party that surely left our guest with sugar plums dancing in their heads! Join us! Sawyer’s outfit was vintage Florence Eisemen and his personalized party hat was made by Dainty Couture. The Sweet Boutique provided all of our desserts and refreshments with the exception of our exquisitely handmade nutcracker cookie tray. Those beauties are the work of my dear friend and cookie genius, Pamela of Pamcakes Bakes. Paper goods were designed by our friends at Scratch Paper Studio. Natasha really understood my vision of the nutcrackers sugar plum shoppe and brought it to life! Couldn’t have been happier! Cookies were decorated and enjoyed by all! We skipped presents and asked that in lieu of bringing a gift for our incredibly blessed boy, that our guests bring an unwrapped toy for our annual contribution to Toys For Tots if they felt so inclined. We ended up with so many generous donations, and of course Sawyer’s friends couldn’t help but spoil him too! We’ve got some truly awesome people in our lives! Lastly, there was cake! Sawyer was a little apprehensive and gentle with his cake smash, which is just oh so completely HIM. Our tiny gentlemen! My favorite snapshot from Sawyer’s Sugar Plum Soirée also happens to be the last. My eyes filled with the happiest of tears and Sawyer’s precious grin. I was feeling SO incredibly blessed by this boy in this moment, I couldn’t be more grateful that it was captured! Don’t you just want to live in those moments? When your heart is just completely full of bliss in motherhood? We wish you many of those moments this season, and hope you enjoyed a peek at our special day!